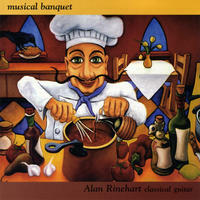 Alan Rinehart: A feast of renaissance and baroque music. 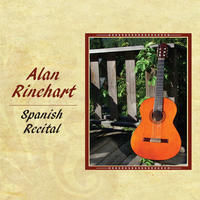 Alan Rinehart has made many contributions to the guitar world as a performer, teacher, and music editor. Completing studies at Western Michigan University and a Professional Music Training Diploma from Vancouver Community College, he studied lute repertoire and technique in London, England at the Early Music Centre with Anthony Rooley, Jakob Lindberg, and Emma Kirkby. His study of historical performance practices led to the ability to play the lute with a softer 'no nail' sound and the guitar with standard concert guitar technique. In 1980 he gave a critically acclaimed London debut which was described by GUITAR INTERNATIONAL magazine as: "consistently clean and musical...he has a pleasantly relaxed stage manner which won over the audience right from the word go". In addition to many concert recitals, he has performed at international guitar festivals in Toronto and Quebec and on CBC radio and TV. A strong advocate of new music and well as historical repertoire, he has commissioned and/or premiered major works by many contemporary composers including John W. Duarte, Maximo Diego Pujol, and Canadians Stephen Chatman, Brian Tate and John Oliver. He has released three solo CDs and one CD with the Vancouver Guitar Quartet that have received international critical praise. 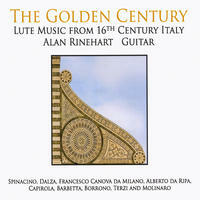 His latest solo CD 'The Golden Century-lute music of 16th century Italy' was released in Spring 2010. Alan Rinehart is a co-founder of The Vancouver Guitar Quartet that became a regular part of the Vancouver and Western Canadian music scene in the late 1980's with many concert and radio appearances including broadcast concerts on CBC's ARTS NATIONAL, and enthusiastically acclaimed performances as featured artists in the host pavilion at EXPO 86. After an hiatus of a number of years the Quartet reformed in 1996 and released its debut recording 'Estampas' in 1999. The Quartet disbanded in 2003. 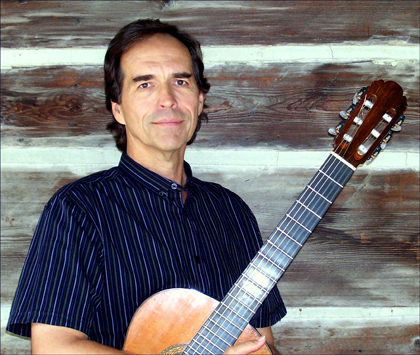 His editorial work has included arranging and engraving the guitar performance edition of the Moscow lute manuscript of Sylvius Leopold Weiss for Editions Orphee and compiling and engraving a volume of music by Spanish guitarist A. J. Manjon for Chanterelle-Mel Bay as well as preparation of guitar solo and ensemble music for his own company NovaScribe Editions. He was a faculty member of the music schools at the University of British Columbia and Vancouver Community College from 1983 to 2003. At UBC, he and Michael Strutt developed one of the most comprehensive guitar performance programs in Canada. He continues to be in demand as an adjudicator, instructor and clinician. His students have won major competitions and have completed advanced degrees in guitar performance and composition and established significant careers in the music world. After a long time residency in Vancouver, B.C., he moved to Nelson, B.C. in 2004 where, in addition to teaching at the Nelson Academy of Music, he was on the Board of the Nelson and District Arts Council and was the coordinator of the 19th Northwest Guitar Festival, a 3 day event held in Nelson April 16-18, 2009. While in Nelson, he hosted "the Art and Times of the Guitar", a weekly one hour radio show devoted to the classical guitar, for 11 seasons (176 shows) on CJLY, Kootenay Coop Radio. Alan is currently living and working in Kelowna, BC, Canada and you can find out more about him on his website. Alan Rinehart lives in Kelowna, Canada. Tagged as: Classical, Renaissance, Instrumental, Composer: Albert de Rippe, Composer: Francesco Canova da Milano, Composer: Francesco Spinacino, Composer: Giovanni Antonio Terzi, Composer: Giulio Cesare Barbetta, Composer: Joan Ambrosio Dalza, Composer: Simone Molinaro, Composer: Vincenzo Capirola, Composer: Vincenzo Galilei, Lute.